Room to roam in this spacious 2 story family home on a quiet cul de sac street. Big windows fill this home with light. Freshly decorated through out, this home is in move-in condition with beautiful hardwood floors in the entry, kitchen, breakfast room and family room. Kitchen has lots of cabinets and a pantry closet. Front and rear covered porches for summer enjoyment. Rear paver patio overlooks the secluded back yard. You will be impressed with the size of the bedrooms and closets in this home! The sky-lit master bath has a separate tub and shower. Formal living room and dining rooms plus a 1st floor laundry that has a deep sink, folding counter and storage closet. Refrig, washer, dryer hi-eff furnace and central ac all new since 2012, most ceiling light fixtures replaced in 2015. Clean full basement is perfect for expanding your family living spaces. 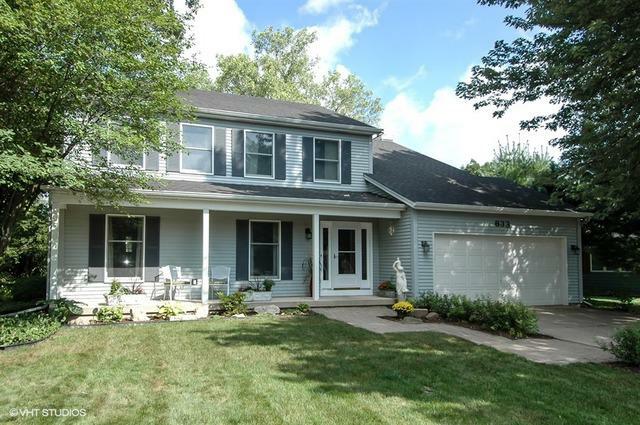 Wood Ridge Ct is uniquely located near Creekside Elementary School and surrounded tall trees in every direction!